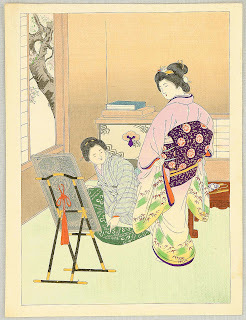 there are several things that i wonder about in the japanese culture i see in the prints. for example, why are the mirrors so often draped? is it merely (merely?) for decoration? 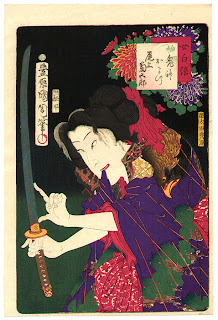 another thing i wonder about is those obi 'bows' in the back. it looks to me like they either make a woman look hunch-backed or thick-waisted. since neither are at all preferable in western culture (whereas the 'big behind' of a bustle might be), what am i not understanding? and the last thing here... the one i'm most curious about of all, is this: why do these women take their clothing into their mouths so often? now, if they are washing their hands, or even preparing their swords (!) and need to get those voluminous sleeves out of the way, i could understand. if they are in a rather intimate situation and are holding tissues, that i understand as well. but these women do it much more often than that. is it instead of smoking? i have done it when i was scared. is it again with the modesty, like how a japanese woman will cover her mouth when she laughs (or we when we yawn)? in any case, these questions will stay out there (i might post more examples) until someone with actual knowledge (or a damn good story) comes along! I have no answers but you've got me interested! you know, karla--that's helpful, because in a strange way i realize that wondering all by yourself can be lonesome! These three issues are quite interesting, i have no definite answers too, but base on Taiwan was occupied by Japan in 1895-1945, Some culture may have influence on each other. 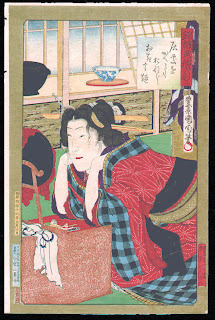 In the east (at least so far as I know in a wide range of Chinese lives), the mirror is very cautious in the use, by geomancy(風水), the bedroom mirror can not face the bed,and not on the positive import of main entrance,because people will be scare under unconscious , the soul will be taken away ... So when not in use.mirrow often used draperies cover. Mirrow also be reflect the heart as a symbol of self-cultivation, mirrors often to maintain as a clean/no dust condition and avoid oxidation rustespecially in ancient times (bronze mirrow) . Until now, on the back of the sofa covered with cloth is also common. 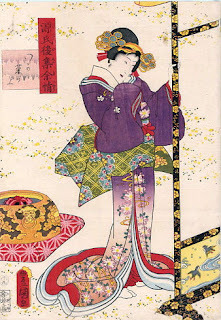 As for the second question,i guess that should be based on the aesthetics of their culture, resulting in contrast, a Japanese woman postured and concentrated in their neck and shoulder lines, the others will not deliberately emphasize,obi 'bows' in the back on other hand there is a saying, easy to remove when necessary as a suicide cloth, like Japanese men so perseverance when suicide as laparotomy, This is very difficult to imagine with Western culture. 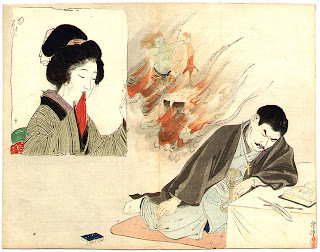 In east , Assassins (such as Japan's ninja), implementation tasks often stuff something to keep silent and avoid damage to more important matters, even rubbing cloth or bite long hair is a common thing. Woman in childbirth will probably stuff their mouth with a cloth....and so on, i guess that should be an approach for concentrate their attention . :)JUST FOR FUN!! such interesting answers, hp, thanks, all three of them. jewish people cover the mirrors when someone dies. and i agree--the style necessities you mention are difficullt for me to really understand fully. 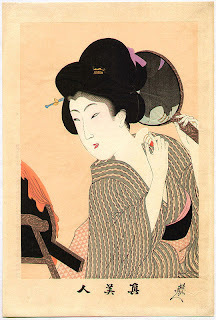 "What Mary Cassatt and her friends and colleagues in 1890ies Paris did not and could not know is, that biting a handkerchief (or any other textile) in Japanese art indicates a certain sexual arousement - plainly speaking, Utamaro's young girl is madly randy!" thank you cynthia. yes, i had read that as well, but it simply doesn't appear at all realistic, given the contexts in which the action appears. sure, one often sees in in the bedroom, and there that meaning is obvious, but given it's, like mentioned here, when one is washing one's hands, or sharpening one's sword, or watching one's husband read about burning in hell or, as here, watching dogs fight--i think that if you expand your explanation to mean any emotional arousal--not just sexual--then you've got it.